If you have been in business for a while you might be getting emails that say, “I have noticed that you are not ranking on the first page of Google.” As a web designer and owner of this website, I get a myriad of spam comments as well as a host of emails about the fact that my site is not ranking on page one of Google. Well, that isn’t true. The reality is, they may not be searching for the key words or search terms that I am trying to rank for. That is the key to successful SEO and Search Engine Marketing. When I first got into web design, design was my primary focus. I am sure you have seen a website that was heavy on design in the past, but because of mobile devices and the plethora of screen sizes it is no longer advisable or cost efficient to have a site that is incredibly design heavy. Google ranks websites based on page load speed as well as content, tags, schema and a host of other things. Google’s algorithm doesn’t take into account clever design. With 100’s of clients all of them have wanted the same thing – to attract customers and to make money from those customers. So great design is important, but it should not be overdone otherwise you will start getting diminishing returns. So how do I get my site to rank on page one of Google? After all of the work and research that I’ve done with Google Adwords, Social Media Marketing and web tools like Zoho and Hubspot, the one thing that has been consistently working for me across the board is creating search terms and phrases that you want to rank for. If I tell people to search Google for “Web Design” there is no way that ChemistCreative is going to rank without a lot of work. If I try to rank for “Web Design Denton Texas” at the time of this posting I come up number three on page one of Google. This is a screenshot of Google when I searched for “Web Design Denton Texas”. 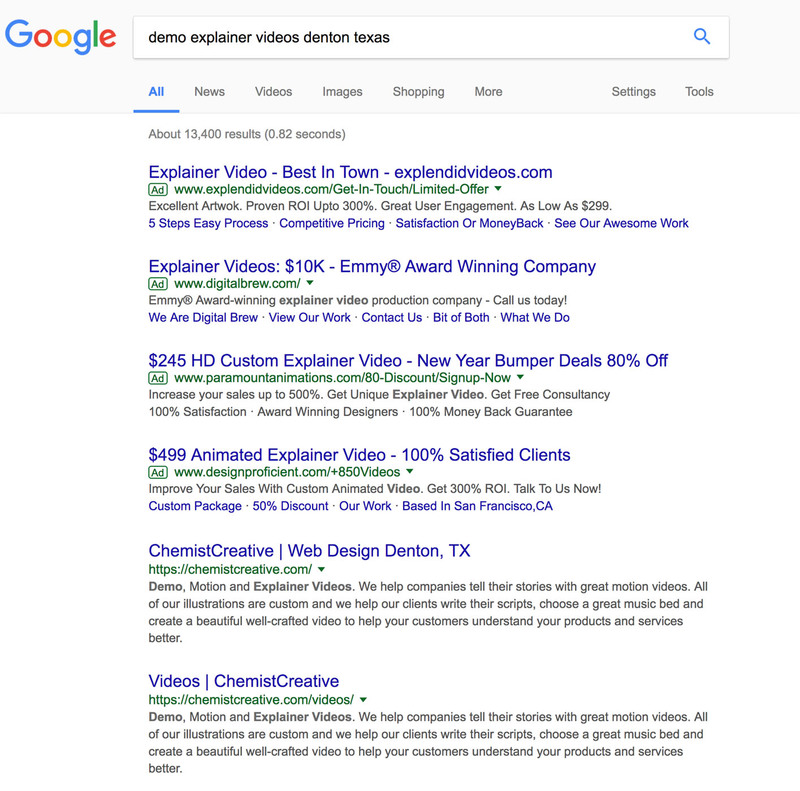 I have put Denton, Texas in the title of my site as well as Graphic and Web Design in the meta description of my site. I have also spent time getting some good 5 star reviews on Google. However, what is interesting to note about this ranking is that I don’t have a Denton, TX physical location. The places that come up on the Google Places map are going to get a higher rank than me in that area because of their physical address. Where you are located is critical information in Google’s algorithm because they are trying to give their searchers the best options based on their searches. 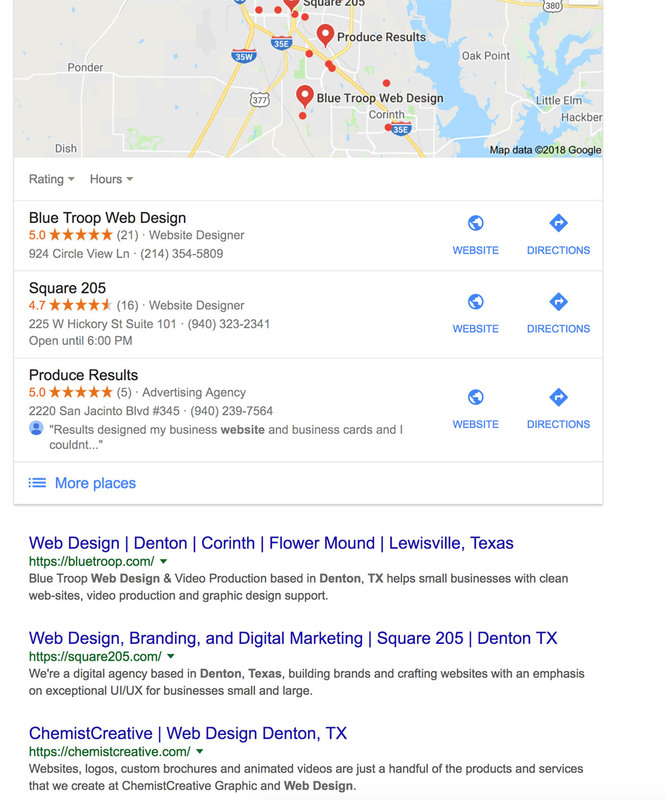 My business address is listed in Corinth, TX and so ChemistCreative does come up on the Google Places page if you search for Web Design Corinth, TX. Because there is so much completion for services online, when creating your SEO plan you need to determine a series of keywords that you want to use that correlate to the services that you provide. As you can see we grabbed the number one and number two spot on Google for demo and explainer videos. My goal was to have a search string that someone else wasn’t trying to rank high for, but instead a search string that I used Google’s Keyword Planner. It takes work, but Google has created tools to help individuals create the right plan to drive traffic to their site. So my point to writing this post is to dispel the myth that you have to spend thousands of dollars and months of time to be ranked on page one of Google. And, when a company from India tells you that you aren’t ranked on page one of Google, then you don’t have to believe that either because they have no idea what keywords you are trying to rank for. Lastly, what is also consistent across the board with SEO and ranking on Google is creating content that is relative and useful. Moz.com suggests that you write posts that are 10 times more interesting and valuable than your competition. I am not sure how you can determine what is valuable to an individual, but I think the point is – we need to create content that is well written and provides value. There is too much content out there that just wastes time. In closing, I’ll give one more example where keyword phrases and ranking are working for one of my customers. 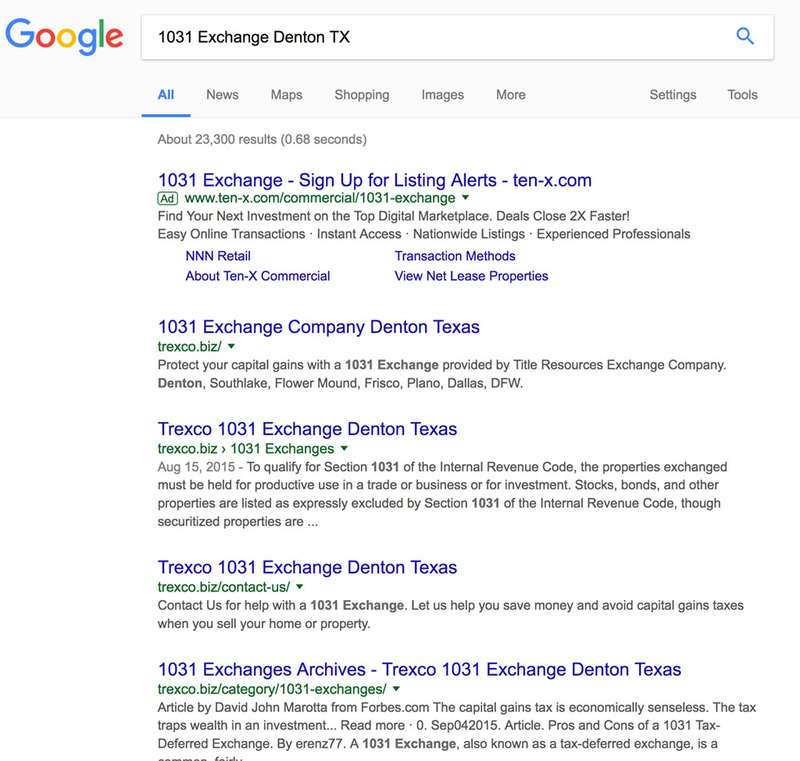 The business Trexco.biz in Denton, TX does 1031 exchanges. This is a business that has quite a bit of competition, but not a lot of competition in Denton, TX. So we didn’t try to rank for locations all over the Unites States, instead we focused on getting ranked on page one for Denton, TX with the key phrase 1031 Exchange Denton, TX. Here is a screenshot of Google taken on January 4, 2018 at 11:00 a.m. on Firefox. I wasn’t signed in to Google so that my location preferences weren’t turned on. (This also affects search results) On this screenshot you can see that they have the first 4 non-paid results for that key search phrase. What is key is that the longer those terms have been in place the higher their positions ranked on Google. I setup the SEO on this site over 3 years ago. Write great meta descriptions for all of the pages on your website, include keywords, be short and specific. Make sure that you have a clear call to action on your site once people do get there. If you are in need of SEO or Content Writing Services, ChemistCreative has monthly plans that start at $300 a month for four blog posts that are researched and written to drive traffic to your site. The great thing about content is that it lives on your site forever and over time increases your web value. Unlike money paid for ads, money paid for content has residual return value.